#DecolonisingContraception is a movement that aims to promote discussion on how sexual and reproductive health has developed from unethical medical research often on colonised populations. As part of the gal-dem #DecolonisingContraception series, we will uncover the colonist history of contraception, discuss modern contraceptive methods and start a conversation about our daily contraceptive struggles. This series is about helping those accessing contraception and other sexual health services to feel empowered to take make informed choices and strive for reproductive justice (even if you practice abstinence). Several years ago, when I informed my mother that I had a progesterone implant fitted to prevent pregnancy, she stated I was silly and it would ruin my fertility forever (untrue). My mother was born in Britain, educated to university level and yet remains very sceptical about hormonal methods of contraception. It did not matter to her that I was a doctor and well-informed of the risks and benefits of the implant (and subsequent infertility is definitely not one of them), as far as she was concerned I had made a detrimental choice. It may seem easy to dismiss my mother’s concerns as an isolated incident, but her anxieties are fuelled by stories and rumours passed down through generations; intensified by stories of colonial regimes and Western countries attempting to control the fertility of colonised women. In 2003, the oral polio vaccination campaign in northern Nigeria failed as rumours were rampant that it would spread HIV and cause infertility. Whilst these claims were ludicrous, they were embedded in a long history of dubious colonial and post-colonial practices within this region. Widespread suspicion of biomedicine amongst colonised communities and diaspora populations has been widely documented by researchers. Data from the National Survey of Sexual Attitudes and Lifestyles consistently reveals that women from all ethnic minorities are less likely to utilise contraception in favour of condoms compared to their white counterparts. The use of contraception to subjugate women of colour is deeply rooted in colonial history and has left subsequent generations feeling suspicious of contraception and worried about the long-lasting effects that hormones may have on their bodies. We must start to have open and honest conversations about the role reproductive health has had in controlling and subjugating populations. Early colonial explorers characterised African people as hypersexualised, immoral and promiscuous, believing them to be at high risk of sexually transmitted diseases and in need of population control measures. Unless we start an honest discussion regarding brown and black bodies and how gynaecological experimentation on these bodies has assisted in developing modern contraceptive technologies, we cannot realistically expect such women to engage with contraception fully. Without these discussions policies such as “the Global Gag” rule, which allows the funding of sexual and reproductive Health services in developing countries to be determined by the political players in the United States. When implemented, “the Global Gag” rule often prevented charities that carry out abortion work from receiving US government funding, resulting in the defunding of reproductive health services in numerous countries, from India to Malawi. How did we arrive at the point where government officials in Washington determine the reproductive choices of women of colour globally? Whilst many may have heard about the Tuskegee experiments, in which African American men were studied for the progression of syphilis without their knowledge, many of whom went on to develop fatal complications due to untreated syphilis infection, less is known about just how contraception has been used to control the lives of women throughout the 20th century. Below are some of the worst colonial practices of sexual and reproductive health that have served to oppress and control people of colour. This list is in no way exhaustive but just some of the ways that contraception – which should have been liberating for many women – has been (and continues to be) used as a tool of oppression. We owe a lot to our ancestors who unknowingly sacrificed their fertility so that we could have reproductive freedom. It’s time for all of us to better understand the harmful history of reproductive medicine and start changing the narrative. Contraception is not something that happens to you, it is something that was made for you – and you have the right to choose whether or not to use it. 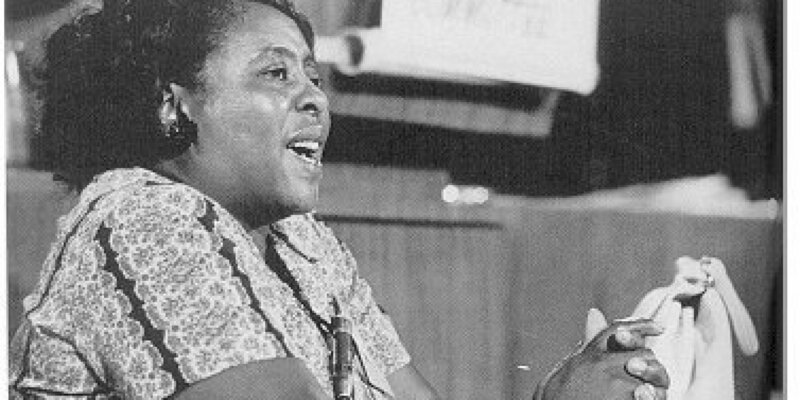 Sterilisation of African American women and other formerly enslaved groups It was the American civil rights activist Fannie Lou Hamer (pictured above) that highlighted the idea of the “Mississippi appendectomy,” where mostly African American and Native American women underwent hysterectomies without their consent. She underwent her own after being admitted to hospital to have a uterine fibroid removed. There are also other cases documented of surgical sterilisation procedures being performed on indigenous peoples as a means of population control and without their consent, for example, the Aboriginal people in Canada. The struggle of black Zimbabwean women for reproductive freedom When the black government of Zimbabwe took control in 1980, they rapidly banned Depo-Provera (a form of the birth control hormonal injection) as they saw it as neo-colonialist tool and a symbol of imperialism. It was felt that the long-acting injection had been implemented by the white government to reduce and control the number of black Africans within the population. Interviews of farm workers and those within government suggest that the coercive use of Depo-Provera did indeed take place, particularly by white farm owners coercing their African labourers into using the drug. Although many Zimbabwean women chose to utilise Depo-Provera, the injection became symbolic of the struggle between Black Zimbabweans and colonial powers. The needs of Zimbabwean women were secondary to the ongoing political struggles and women were forced to find an alternative contraception to meet their needs. Population control in Apartheid South Africa The white minority government utilised family planning programmes to reduce the growth of South Africa’s black population (which was 75% of the population) during apartheid. The government also used policies that made having more children economically challenging for black South African women. Although it is unclear to what extent these policies had an effect on women’s reproductive choices; it is evident that the needs of South African women were not a priority for either side on the political spectrum. Rather, their fertility served as a battleground for political ideology. The birth of the pill after experiments on Puerto Rican women Before the pill was given to white American women, it was tested on Puerto Rican women in 1956 several of whom were then subsequently sterilised. Puerto Rico was chosen as an ideal location as officials felt that birth control may be used as a form of population control and to help end poverty. By 1965, it has been suggested that one-third of women (that had ever been married) aged 20-49 had been sterilised. These trials were then expanded to other former colonies like Haiti and Mexico. The racism of Margaret Sanger, founder of Planned Parenthood Margaret Sanger is often praised as the founder of Planned Parenthood (one of the leading reproductive health charities in the US) yet, it is widely acknowledged that she was a fan of eugenics (the principle that some social groups or races are genetically inferior to others). In a famous speech in 1921, she proclaimed that procreation by “irresponsible and reckless people” needed to be stopped. Planned Parenthood is an integral and much-loved charity that provides Sexual and Reproductive health services to people globally, however, the questionable beliefs by its key founder are rarely acknowledged or interrogated. Without fully acknowledging its history, those that oppose the good work that Planned Parenthood does will continue to use Sanger’s support of eugenics as a means to undermine the organisation. Planned Parenthood should openly start discussing its history and other issues of neo-colonialism within its practice. Planned Parenthood does vital and important work globally yet, its offensive and problematic history is rarely acknowledged. #DecolonisingContraception is about starting a much-needed conversation on how brown and black bodies have assisted in developing modern contraceptive technologies through gynaecological experimentation. We cannot realistically expect people of colour to engage fully with contraception unless this happens.